Place the fillets on a flat surface and pound lightly with a flat mallet. Set aside. In a skillet over medium-high temperature, heat the vegetable oil. Add the onion and cook, stirring often until lightly browned, about 10 minutes. Add the prosciutto and add the mushrooms. Sauté slowly, about 10 minutes, stirring occasionally, until the mushrooms have softened. Empty the mixture into a sieve and drain well, pressing down with the back of a wooden spoon to extract most of the oil. In another skillet over medium-high heat, melt the butter. Add the mushroom mixture and blend well. Add the beef gravy and marsala wine. Sprinkle with the parsley, lower the heat to medium, and simmer about 20 minutes. Dredge the meat lightly in the flour. To a third skillet, add the oil to a depth of about ½-inch and heat over medium-high heat until just about to start smoking. Cook the meat quickly, about 2 minutes total, turning once. Transfer the meat to a colander and let drain. 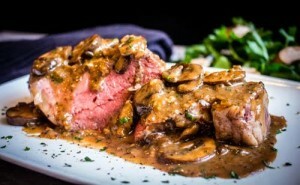 Spoon half the mushroom sauce into a 9×12-inch baking dish and arrange the beef slices on top. Spoon the remaining sauce over the top of the meat, then place a slice of mozzarella on top of each slice. Bake 10 to 15 minutes or until it is piping hot and the cheese is melted. Let cool for 5 minutes and serve.